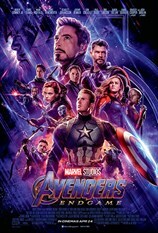 Win premiums from MARVEL STUDIOS' AVENGERS: ENDGAME! with min. of 4 tickets purchased. 1. For Box Office purchases, please attach your ticket stub to the lucky draw form and drop it at the box located at the information counter at level 3. 2. For online purchases, please register online. 3. Closing date for contest: End of screening. 4. Contest is only for WE Club members.5. WE Cinemas is not an agent of the merchants and makes no representation as to the quality of goods and services provided. 6. 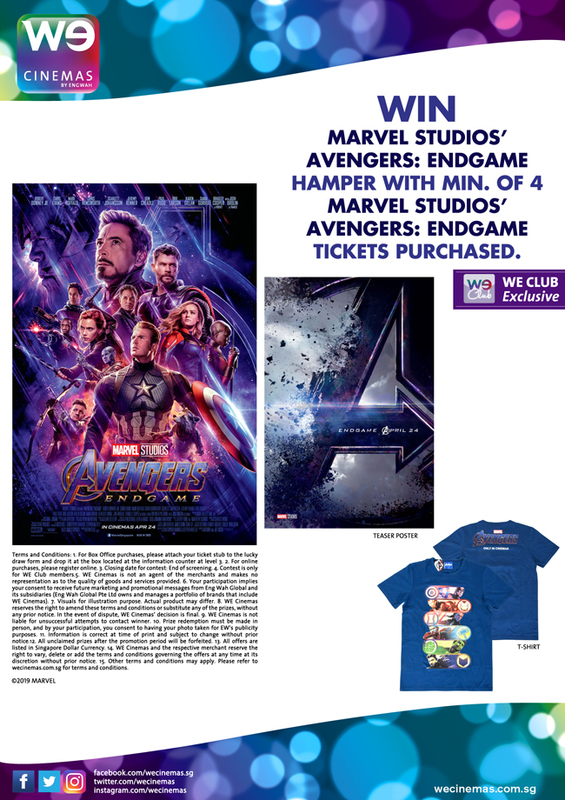 Your participation implies your consent to receive future marketing and promotional messages from Eng Wah Global and its subsidiaries (Eng Wah Global Pte Ltd owns and manages a portfolio of brands that include WE Cinemas). 7. Visuals for illustration purpose. Actual product may differ. 8. WE Cinemas reserves the right to amend these terms and conditions or substitute any of the prizes, without any prior notice. In the event of dispute, WE Cinemas’ decision is final. 9. WE Cinemas is not liable for unsuccessful attempts to contact winner. 10. Prize redemption must be made in person, and by your participation, you consent to having your photo taken for EW’s publicity purposes. 11. Information is correct at time of print and subject to change without prior notice.12. All unclaimed prizes after the promotion period will be forfeited. 13. All offers are listed in Singapore Dollar Currency. 14. WE Cinemas and the respective merchant reserve the right to vary, delete or add the terms and conditions governing the offers at any time at its discretion without prior notice. 15. Other terms and conditions may apply. 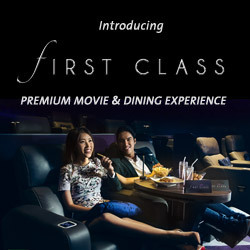 Please refer to wecinemas.com.sg for terms and conditions.